Well, it's taken me long enough to post today, that's for sure! That's because I was a bit scared to post this,....but, you can't grow if you don't do what's uncomfortable, right? I hate to say that (especially publicly) as I'm sure I'll be black-balled from every jewelry magazine, craft site, blog, etc. in the beading and handcrafted jewelry world!! But, I can't sit here and pretend this doesn't bother me. their arte metal blanks and charms, too. But this wire is just not doing anything for me. 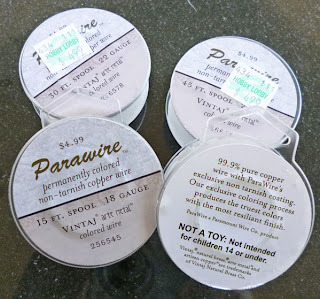 And yes, I've used other Parawire/Vintaj brand wires with much better success. At least that's a positive, right?! 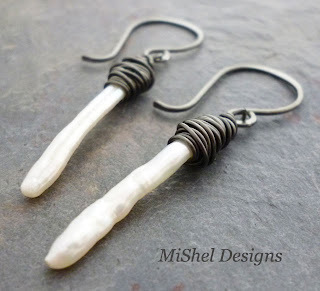 The "permanent" coating peeled off when I wrapped it around these pearls with my hands (no tools used). At least the 24 gauge wire did, anyway. And you can see in my loops, where I did use tools, what happened. (And no, I don't have that heavy a hand). The 22 gauge wire held up a smidge better on another pair, but not much. And hammering the 20gauge wire into ear wires (not for sale or anything, but just to try it out for myself and see how it handled) well,....the minute the hammer touches it,....yuck,...guess it's not meant for that. But hey, you gotta experiment and try stuff or you'll never know, right? So, on a positive note - if I take pictures at the right angle, you really can't see the 'mucked-up' wire - right? Yea,...I can still see it, too. 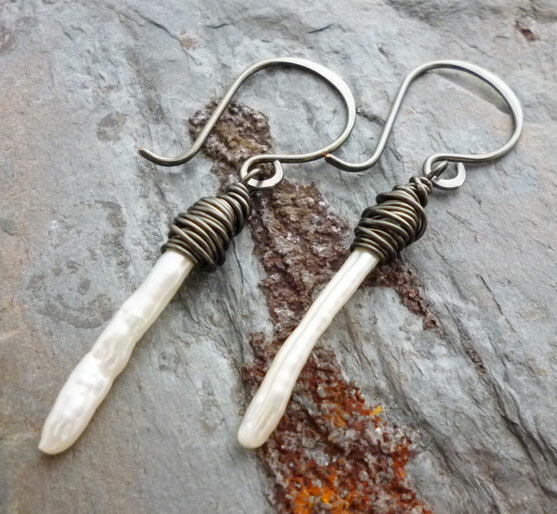 The Artisan Copper and Antique Bronze wires both hold up much better when I beat them up with my hammer or wrap them around tiny little pearls. 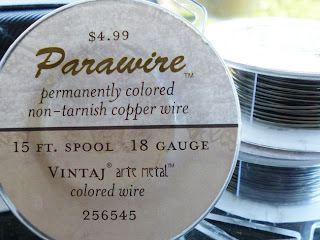 And, to be clear here, I do like other Parawire and Vintaj products,....just not this particular wire I purchased. 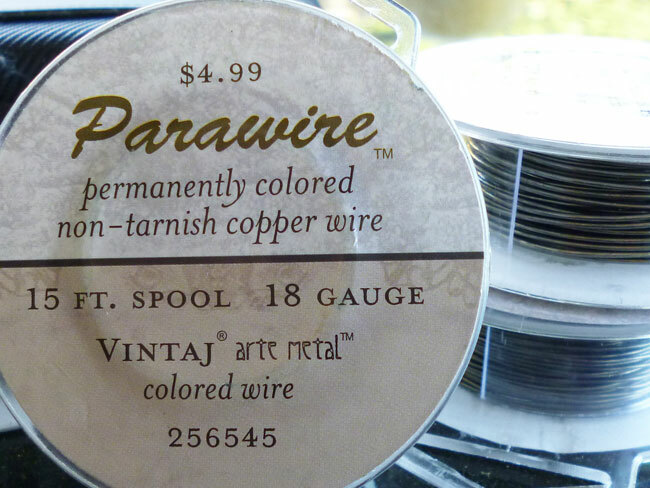 Someone please tell me that it's just these few spools that I purchased at Hobby Lobby and not all of Parawire's Vintaj Arte Metal Colored Wire - please??? These poor little pearls probably think I hate them right now. 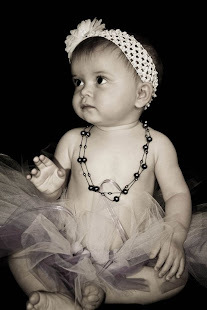 See, I'm not the only silver snob - my pearls like it, too!! Ooohhhhh,...I just got taken off a bunch of 'blog rolls' right there and half my followers just quit following me. I'm going to be ripping these little babies apart tomorrow and re-doing them in sterling silver and dipping them in some LOS till they're black like these here. Then I'm sure I'll be thrilled with them! Anyhoo,...now that all that's said,...I'm here, ready for the 'Shel Bashing' to start - so go ahead. I won't whine when people leave mean comments 'cause I know you're all are in love with both Parawire and Vintaj (and I am too) and they're the hottest things around right now,....so go ahead,...let me know what you think. No profanity though - those comments won't get through!! Peace, Love and "Going Out On A Limb!" 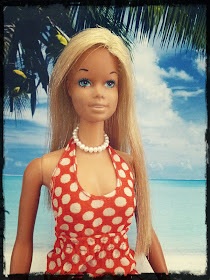 Oh - I'm linking up with I heart Macro today, too. You should see the amazing photos on todays' line-up. HOLY COW they're amazing!! Don't be so hard on yourself, I too have had my ups and downs with bad batches of wire, beads and even crimps. These earrings are still very pretty and have a nice rustic look to them. Can't wait to see how they look with the silver! You are just being honest and explaining what you discovered. Others may now have the courage to be honest and have an opinion too. Your photos are nice and clear. Hope you are pleased with the product once redone. Thanks for your wonderful comments on my blog, so nice to hear. Lovely compositions, performed with great delicacy, I like how you worked these materials and the outcome. Glad you told it like it is! The rest of us beaders love that you did! Have a great week. Hey everyone - thanks so much for your kind words and your understanding! I do LOVE all my other Vintaj products and my other types of Parawire, too! Maybe it's just a bad batch that I got or something weird like that. thanks for dropping by my blog...it's fun to see what you do over here - you are very talented, even if this latest creation frustrated you. hope you have a great week! First time on your space and loved it. NO BASHING FROM ME! Honesty with what you are making is what it is all about. Also great that you are willing to do it over with a better product and not just sell it like it is..... ( Still looks pretty though and you did a good job with what you had. Firstly, I think you will get more followers with honest posts like this! I have used some of those wires and I personally think they are inferior to 'straight-up' silver, copper or iron wire. I haven't tried this brand, but have had good luck with certain brands and shades of "permanently colored copper wire." 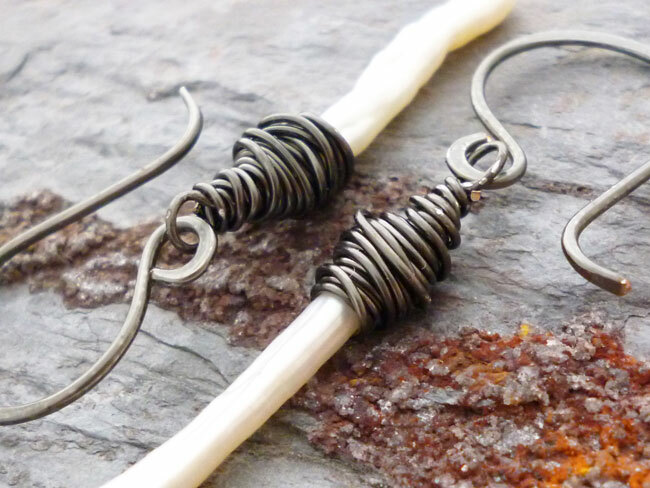 I'm sure none of these compare to silver wire, but I use Artistic wire in Silver and Darlee for Gun Metal. (Not great results with aqua or pink.) The heavier the wire, the better it holds up. For instance, the 16 gauge in the gun metal just did very well to my hammering to flatten the ends, and I hammer-harden all my wire, even the thin pieces. I like the darker wires those because should a dab of copper show through if I completely flatten, it still looks good--rarely hit copper though. I've never had the coating flake off though, so I'm glad to hear your honest report on this brand. Finally, if you are serious about losing a lot of followers, be aware that there are many reported instances of this happening on blogger--including my own reports. I watched it happen on 2 occasions as half my followers disappeared chunks a month or two ago. I was so discouraged! Eventually, I think all were returned to me, but it took about a month. Thanks again for everyone's honesty - I appreciate it. 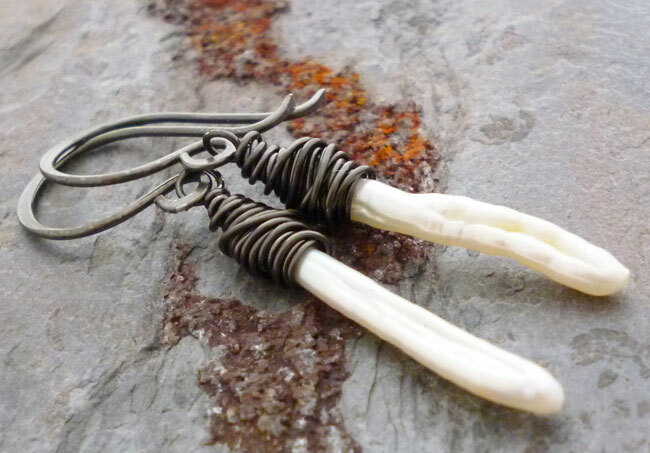 But, I'm still partial to sterling or fine silver, copper or brass. They just feel so good in my hands, ya know? Hi, First time on your blog and I was surprised to find an issue close to my heart. I'm a big-time wire user so I've tried lots of stuff but I keep going back to "real" wire ( copper, silver, brass and even steel). I tried this product, too, and was disappointed. It just doesn't "feel" right. No oofense to those who use and love craft wire but it doesn't work for me. I've never had any luck with coated wires, so if you've had luck with SOME you're ahead of me! First time visitor to your blog. I am impressed with your honesty about not liking this wire. Not everything is going to work and it is good to give constructive critism. 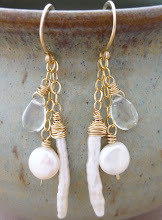 I have not done much wirework in the past and am just really getting into jewelery making rather than just beads. I will keep your critique in mind when looking for wire. Thank you for the review! I have never used this wire and will now make a mental note not too bother with it!!! This must have been a huge disappointment for you! It really was Val, cause I like a lot of my other parawire products and my Vintaj products are super cool and fun to work with - let me tell you!! 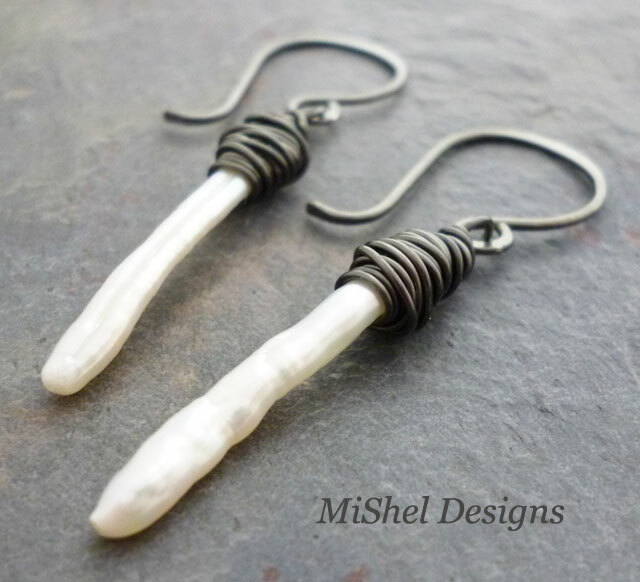 That's why it was such a hard post to do - but I had people (mostly clients mind you) ask me about some of my designs using metals other than silver or copper. I'm not a fan of Parawire because it's so slippery, and I'm constantly losing my grip. 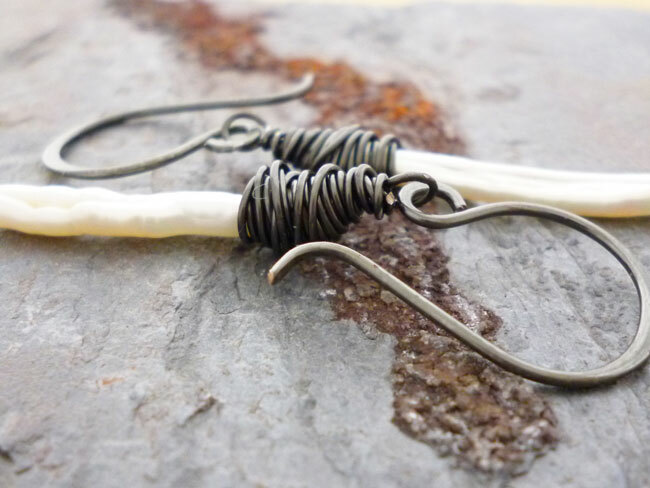 I ended up buying real bronze wire and antique it as I need to. And I agree, love the other Vintaj products but this wire has me at an impasse.